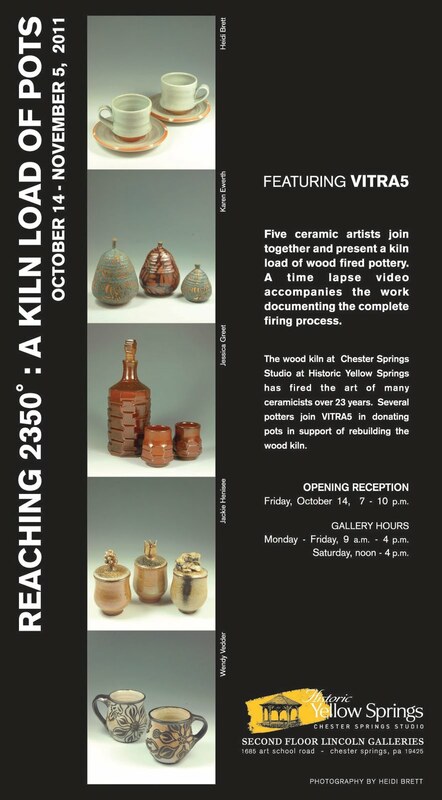 Reaching 2350°: a kiln load of pots is an inaugural show for the group Vitra 5 which includes Heidi Brett, Karen Ewerth, Jessica Greet, Jackie Henisee and Wendy Vedder. A collective fascination with wood firing has been their focus over the last eighteen months. The mysterious atmosphere, combined with the risk of the process, and the pursuit of distinct work that would best fire in a wood kiln, led to the concept of exhibiting every piece from one kiln load. This exhibit expresses the totality of the unique cups, bowls, jars, vessels, mugs, plates, and pears marked by the flames and ash as the glazes melt, reaching the temperature of 2350°. This rugged process, unique to wood firing, is captured in a time lapse video presentation. The wood kiln at Historic Yellow Springs has fired the art of many ceramists over 23 years. Gallery space is devoted to the pottery of other skilled craftsmen, who will be joining Vitra 5 in displaying the distinctive voice of the wood fired work. It is the vision of Historic Yellow Springs to rebuild the wood kiln and the proceeds from these generously donated pots will support the fundraising efforts. For more information, visit yellowsprings.org.